There were so many books that I both lost myself in and found myself in as a child… the Little House books, all of Louisa May Alcott and the Anne of Green Gables books, Edward Eager and E. Nesbit. I could point to a hundred reasons why each changed my view of the world, helped me see more deeply into life, carried me away. But the book that comes to mind today is Irene Hunt’s Up a Road Slowly. This book was probably the first YA book I read, before YA was called that. I remember reading the first chapter—deeply realistic, emotional, a young girl talking about her mother’s death. At the time, something happening to my parents was my biggest fear in life, and I remember being both attracted by and terrified of this book which grappled with something so terrifying. It took me weeks to read beyond the first few pages—and then I was enthralled. It was also the first “kissing” book I read—which led to a lifelong love affair with such books. Though it was set in the 1960s (when it was written), Up a Road Slowly was the first ‘modern day’ girl’s story I remember. There were no hoopskirts, no discussion of settling the Territory, no Nannies and upstairs maids. It was the story of a girl who could have been me. She was solitary and bookish, impulsive and over-sensitive, in love with words and both baffled and intrigued by the people she loved. Julie was far from a perfect girl, and her struggles felt so true to me. She both adored and was jealous of her ‘perfect’ older sister, and fought with and loved her brother. She was both impatient with and grateful for the old-fashioned ways of her guardian, Aunt Cordelia. Like me at the time, she was silently madly in love with a childhood friend (she wound up with him in the end, a vicarious thrill for me). 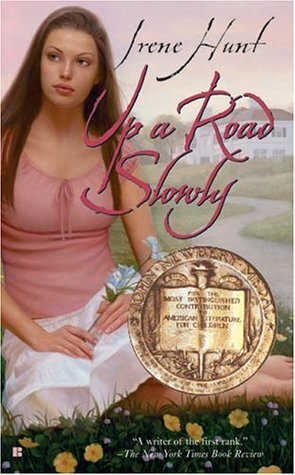 Up a Road Slowly was a book full of mixed feelings, contradictions, hopes, fears and dreams… a true coming of age story. When I write my own books about coming of age, I think of it often. Huntley Fitzpatrick is the author of My Life Next Door (2012) and What I Thought Was True. Her next book is The Boy Most Likely To, another contemporary YA, set in the same world as the first two, about a reckless boy determined to correct the mistakes of his past, a girl dead-set on making no mistakes of her own, and the answers they find together. Hey, I just found your blog through goodreads and am really enjoying it. Up A Road Slowly was one of the first coming of age novels I ever read and it terrified and thrilled me as well. In fact, I think I read it 2-3 times without fully understanding it (perhaps I was too young when I read it, as an elementary school kid I had a bad habit of reading books I wasn’t ready for). Anyhow, it made me smile to see this post and reminded me how much I need to give this book a reread now that I am facing the beginning of adulthood myself. Thanks!